So you’re ready to learn how to surf and you can’t wait to get out in the water to give it a try. First thing’s first…head straight out into the ocean and just go for it, right? Not quite yet! Should a first time golfer go straight out on the course and start hacking away, or do you learn to swing the club on the driving range first? Baseball players spend hours in the batting cage before facing an opponent’s pitcher. Learning a sport’s fundamentals before actually playing the sport is an essential part of starting any new pastime. At WB Surf Camp, we call this introductory period “Ground School.” There are so many things to learn about surfing before you actually go surfing for the first time. These basic principles must be understood in a “classroom” setting before first heading out into the waves. The classroom we use just happens to be located on the beach! BEST classroom EVER right!? Our surf school spends about 45 minutes on the beach doing ground school so that our students have a good understanding of what they are in for during their very first surf session. No two ways about it…learning to surf can be challenging. It is also one of the most rewarding things you can ever learn to do and we work very hard to make the experience a success. Over the past 15 years we have successfully taught thousands or people how to surf utilizing our proven instructional methodologies that make learning easy and fun. Learning the basic moves used in the pop-up. Different type of currents you can expect when entering the ocean. What’s the safest way to fall off a surfboard. These are all crucial things to learn before going out for the first time. We strive to make your first time surfing as fun and safe as possible and our ground school is a necessary step. 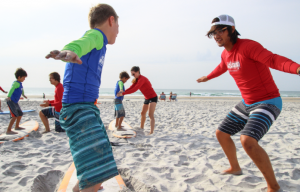 Be apart of our ground school and sign up for a 2-hour Surf Lesson or a week of Wrightsville Beach Surf Camp.